The celebrated San Francisco Mandolin Orchestra returns to the Piedmont Center for the Arts for a concert on Saturday, May 5 at 4 p.m. 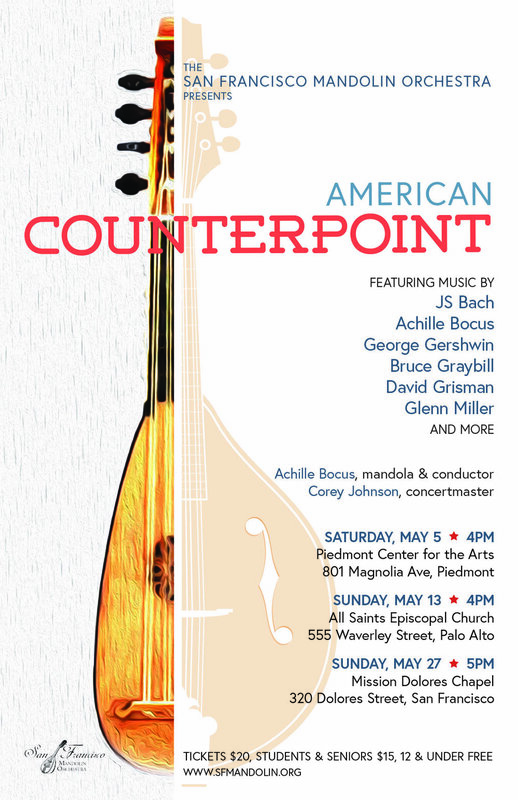 The theme of the concert will be “American Counterpoint.” Counterpoint is defined as: complimentary ideas, arguments, or themes that illuminate each other when encountered side by side, especially in music. Contrast is at the heart of great music. Fast and slow, loud and soft, tension and release, the “counterpoint” of voices—all are prominent in all genres of world music. American composers in particular use contrast prominently in a variety of unique musical genres. The orchestra will be exploring a variety of American written music, and contrasting it to J.S. Bach’s “Art of Fugue,” one of the most famous works of counterpoint. • George Gershwin’s “Prelude II” transcribed for mandolin orchestra. • Walnut Valley Suite, a three movement piece by award-winning mandolin player and composer Bruce Graybill. • “Happy Birthday Bill Monroe” by Bay Area mandolin legend David Grisman. • World premier of Adagio Misterioso by SF Mandolin Orchestra music director Achille Bocus. • “Moonlight Serenade”, big-band legend Glenn Miller’s 1939 hit. The concert at the Piedmont Center for the Arts is family friendly. Admission is $20 general admission, $15 for students and seniors, and free for children 12 and under. Tickets may be purchased online at https://www.brownpapertickets.com/producer/597471, or at the door. The Piedmont Center for the Arts is located at 801 Magnolia Avenue in Piedmont.